The dog can only become what’s in your bubble. The dog is imitating the energy that is in your bubble. You are the source, the feast of energy. If you feel anxious, the dog becomes anxious with you. If you become nervous, the dog wakes up nervous with you. … and I would add that if you are calm your dog is calm with you. This is my darling Abbey. In this particular moment my mirror of serenity in the back garden. 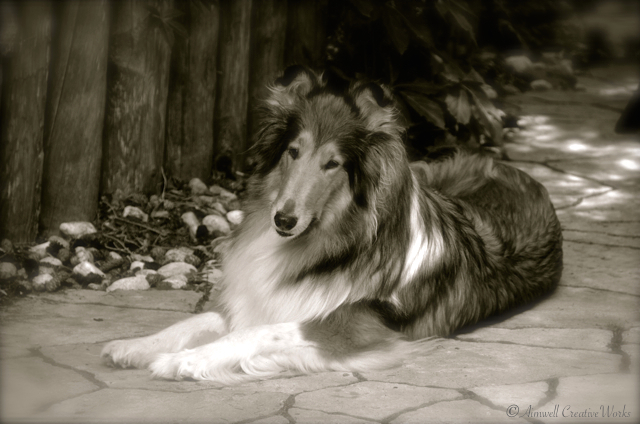 This entry was posted in Animals, Pets, Photography, Uncategorized and tagged Aimwell CreativeWorks, black and white, dogs, Dorothy Chiotti, Light and shadow, Love, monochrome, Photography, Rough Collies, summer. Bookmark the permalink. Hello Abbey 🙂 🙂 – Great pet portrait – Thank you !! !